Apparently, there were many more iPhones(s aapl) and Android(s goog) handsets under the Christmas tree in 2012, which isn’t a holiday gift for the other smartphone platforms. On Thursday, ComScore released its smartphone subscriber share numbers for the U.S. and in the last quarter of the year, iOS and Android phones continued to rise over the prior quarter. Unfortunately for Microsoft(s msft), it got a lump of coal. I’m not surprised by the growth in iOS and Android devices; combined these two accounted for 89.7 percent of U.S. smartphones used in the quarter, per ComScore’s research. What is surprising, not to mention disappointing, is Microsoft’s decline from the prior three-month period. BlackBerry’s(s bbry) share fell also, but that was to be expected: The company’s new BlackBerry 10 devices are only just now becoming available. Although it didn’t have a full quarter to work with — Windows Phone 8 devices launched in early November — Microsoft actually introduced the new operating system in the last quarter of 2012 and Nokia(s nok), arguably Microsoft’s most important smartphone partner, debuted a line of new Lumia phones during the same period. I subscribe to the “smartphone race is a marathon, not a sprint” theory, but when the gun goes off, you need to jump from the starting line. That didn’t appear to happen last quarter; at least not in the U.S.
Google is costing U.S. and other western countries 100s of billions of dollars! Contrary to common belief that Google is good, Google is actually costing U.S. and other western countries 100s of billions of dollars. In a global economy, U.S. has been losing manufacturing jobs for decades, which is bad, but is not so terrible as most manufacturing jobs are low paid. The strength of U.S. is in the high-tech sector. Clearly U.S. has been the innovation leader for many decades. Without innovation, the U.S. economy will eventually collapse. Instead of strengthening the U.S. high-tech industry, Google is set to disrupt the U.S. high-tech industry. If it is done in a good way, then it will be beneficial to consumers and to the future of the high-tech industry. We have seen this kind of disruptions before. A most recent example is Apple. Apple’s revolutionary iPhone disrupted the entire mobile phone industry. It hurt other companies in the industry, but the entire industry has moved up, with Apple being hugely rewarded. Now, Google’s disruption is totally different. If Apple’s innovation is capitalism, where an innovator is rewarded, then Google’s innovation is communism, where an innovator offers his innovation for free. Because Google offers Android for free, including the source code, it makes Google look like a saint, or a company of higher moral standard than Apple or Microsoft. In fact, communism only looks good on paper where people work hard only for the good of other people. We all know what communism is in the real world – suffice to say it’s worse than any worst disaster you can think of. In the high-tech industry, when a giant company like Google makes its Android operating system for free, including the source code and with little or no contract obligations attached to it, it kills any innovation in this industry (country). Today, we are seeing Microsoft is struggling with its commercial Windows Phone OS (BTW, it is much better than Android, but it is not free. ), and Blackberry has a grim outlook. Even Apple is seriously threatened. Android has become the dominant OS for all smart phones. (1) Samsung’s annual revenue is close to $200 Billion, almost 4 times of Google’s and 2.5 times of Microsoft’s. Net income is $21.6 Billion, twice as many as Google’s. (2) China’s smart phone market has skyrocketed into the number one in the world, yet Apple only has about 5% of market share, which is much lower than Samsung’s. The local companies have over 50% of market share. Ironically, Google gets nothing from China, because Android is open source, the local companies don’t make Google the default search engine. In fact, local companies (like Baidu) own the Chinese search market! For many years, the US government and many other US companies have battled with the rampant piracy in China. Gradually, they have made some progress. Chinese government has implemented many laws to fight software piracy. With Google’s communism revolution, now everything is lost: instead of protecting intellectual properties, an “innovative” U.S. company is declaring that all software should be free, including the source code! Suddenly, Google is telling the world that China or Chinese people are most innovative, because that’s exactly their idea and what they have been doing for decades! Without the free and open source Android, can Chinese smart phone and tablet manufacturers grow that fast? Can Samsung become the largest smart phone manufacturer in the world? If software should be free and open source, why not make other technologies also free and open source? Googleâ€™s communism act has cost U.S. 100s of billions of lost revenue. If Android is not free, Apple, Google and Microsoft will dominate the smart phone OS. The mobile OS licenses alone could create another Microsoft! Wake up, American people! Google is an evil that has cost U.S. 100s of billions of dollars and 100s of thousands of jobs. About the author: Aaron is an IT consultant with over 20 years of IT experience. Please feel free to re-post or modify. The title should be “Microsoft lost mobile phone US market share in holiday quarter”. The current title is incorrect: Windows Phone market share is growing and Windows Mobile market share is shrinking. But I guess it gets more clicks and comfort the author into what he (and many Microsoft haters) wants to believe. Microsoft has yet to offer any official sales of Windows Phone-based smartphones. As a result, we have to rely on research firms for their stats. For the fourth quarter of the year, some firms claimed that Windows Phone sales increased in the US, while others stated that the market share for Windows Phone actually went down. This week, Gartner revealed its worldwide smartphone sales numbers for the fourth quarter of 2012 and it was good news for Windows Phone and Microsoft. The firm claims that Windows Phone-based smartphone sales went up to 6.1855 million units for the quarter, which is a 124.6 percent increase compared to the same period a year ago. In the fourth quarter of 2012, when Microsoft launched Windows Phone 7.5, only 2.759 million units were sold. Microsoft’s overall market share of the smartphone business went up to three percent for the fourth quarter of 2012, compared to just 1.8 percent a year ago. Even though BlackBerry’s share has gone way down in the past year, it still managed to stay ahead of Windows Phone with 3.5 percent of the smartphone market. I’m a PC user with Microsoft Office, so I love my Windows Phone. I also love the UI, how I can personalize it for the apps I use most and how easily it hooks up to my computer allowing me to transfer files. I just haven’t had any headaches with it, and I love that about my phone–it’s a joy to use, and it does what I want. Perfect. Well these days you don’t need to transfer any files really. Either you have them in a cloud anyway or you simply use the functions on your phone like Samsung print. So what do you need a PC for? Just Office, right? I have windows phone Nokia lumia 800 it is my best phone i had.My friends love windows phone but they must have lower end models to pick up sales. I never thought I would say this but I’m actually starting to feel sorry for Microsoft. Their time has passed. So had Apple’s. Microsoft isn’t going away any time soon, they are just going to morph into something else and sustain. IBM once sold computers. Microsoft is currently at the spot that I think is the worst it can be in: nobody cares about their products anymore. They have no mojo and they have only got a captive Office audience, which is currently driving all of their sales, XBox aside. Office as a whole sells Windows, Outlook sells servers. In their hard push for us to subscribe to their services, such as Office 365, they have killed off Exchange in the new SBS which means that they have killed all of us small businesses from using their products. We aren’t giving them subscription money, so we have moved to NAS’s for file storage and other services for email. So, going further out with this… if we don’t have Exchange servers and Active Directory services, why on earth would we care about Windows Phone? At this point, we just let the BYOD crowd use whatever they want (and that isn’t Windows Phone) and hook ’em up to whatever OPEN service we are using. Under this model, and with about 500 users from a variety of businesses and industries, I have yet to setup one Windows Phone, or even see one anywhere. i have a small cell phones store where most of my customers bring in there own phones they purchase second hand from ebay, amazon, craigs list, pawn shops, etc. while i see quite a few windows phones i have yet to encounter a single person who got one because they wanted it. every time they were either purchased believing they were android phones or tolerated because of a much lower price tag than the androids they would have preferred. i also do not have a single friend who has purchased a new windows phone. Those Microsoft (Nokia?) shills will have you believing that Windows phones are really, really popular. I hope for their sake and their sanity, they’re well paid for their astroturfing effort. There’s just too much cognitive dissonance coming from them. As Blackberry 10 has just launched, I am most certain it will clinch #3 spot in market share, relegating Windows Phone to #4. Or maybe #5, if Tizen takes off. Do not underestimate a platform with Samsung’s backing. This is instal base and Windows has yet to stabilize it’s share but by now Windows Mobile has to be close to 0 so chances are it will start growing. Nokia sold 700k devices in N America in Q4 (Nokia reported numbers) ,likely the vast majority were smartphones. 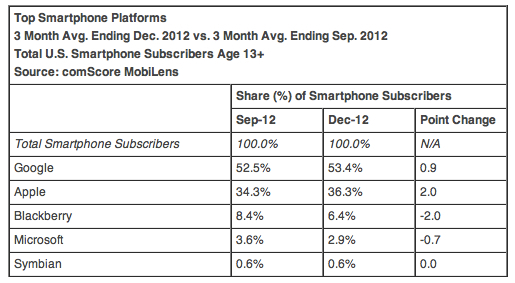 That means more people stop using WM6 and WP7 phones than the people start using WP8 phones. Basically losing market share no matter how you spin it.